We love Christopher Peterson’s amazing one man/many women show EYECONS at the Crystal Room Cabaret at La Te Da. Christopher’s Judy Garland is spectacular! The award winning Christopher Peterson is undeniably one of North America’s foremost female impersonators. His spectacular talent is perfectly showcased in his live cabaret show EYECONS. There is no lip-synching involved as Christopher transforms onstage from one showbiz icon to another. With stellar comic timing and stunning singing skill, Christopher brings an ever-changing array of the world’s most famous divas to life. His Bette Midler impersonation is hilarious, he nails his Kennedy era Marilyn Monroe, rocks Tina Turner, channels Bette Davis, and no one captures the voice and essence of Judy Garland as masterfully. With couture quality costumes (designed and constructed by Christopher) and astounding hair, makeup, lighting, and production values, EYECONS is not to be missed. Christopher Peterson’s EYECONS is the perfect match for the elegant ambience of the Crystal Room Cabaret. The cabaret has been a Key West landmark for over 30 years. With its retro décor, cabaret table seating, and cocktail service, you will feel like you have been transported to a 1950’s Las Vegas supper club. 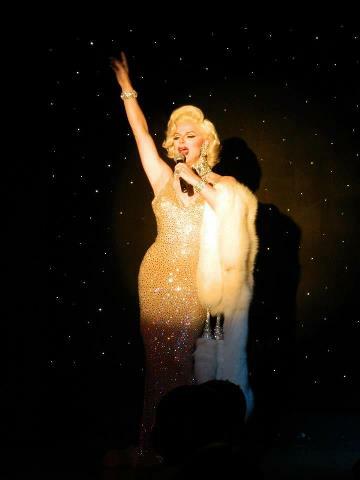 The Crystal Room Cabaret at La Te Da undoubtedly presents the reigning queens of female impersonation. Click here to enjoy Christopher Peterson’s fabulous website. Click here to visit La Te Da’s terrific website. This entry was posted in Entertainment and tagged cabaret, drag queens, Duval Street, female impersonation, Key West entertainment, Key West nightlife, La Te Da, Uptown Duval on May 8, 2014 by Dean.